Premium Grains offers an efficient and flexible grain supply, storage, cleaning, processing, bagging and container packing service. It is professional, reliable, accredited with Australian Quarantine Inspection Service (AQIS) and Feed Materials Assurance Scheme (FEMAS) quality certification, and appropriately located on the Fremantle wharf to minimise handling and transport costs. 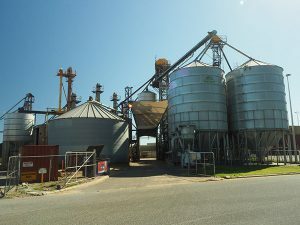 Premium Grains is also a partner in a Melbourne packing operation based in Laverton trading as TRP Grain so that it can provide both west and east coast supply and packaging options. All products are supplied either bulk or bagged in 20 foot containers. Generally supply is available all months of the year, however some products in short production are only available for orders received between November and February.